Leicester are the only side to score in all their Premier League games this season. There were 3 who got this spot-on, and a further 14 had the outcome. Liverpool are unbeaten in their opening 11 matches to a Premier League campaign for the first time since the 2007-08 campaign, as Arsenal's late equaliser takes their unbeaten League run to nine. There were 3 who had this spot-on, with a massive 10 going for a 2-2 getting the outcome. Grabban scored the winner as Forest knocked United off the top of the Championship. There were 4 who got this spot-on, and 6 more had the outcome. Reading win this five goal thriller with their only three shots on target. Nobody had this spot-on, though 14 did get the outcome. Norwich go top of the Championship as they beat Wednesday for the first time in almost 17 years. Nobody got this spot-on, but 18 had the outcome, with 11 going for a 2-1, in what was equally the most predicted result this week. Middlesbrough missed the chance to go back to the top of the Championship following this entertaining bore draw. Well done to sevebalo for being the only one to have this spot-on, and just 2 got the outcome. Eaves scored a double as Gillingham continued their revival with an impressive victory, with ex-U's loanee Hanlon scoring the other. Well done to OAFCWOOWB for being the only one to get this spot-on, and another 9 had the outcome. Ten-man Luton held on to secure a point from this bore draw. Another game with no 3 pointer, though 5 did have the outcome. There were 19 who predicted a win for Luton, with 11 going for a 2-1, in what was the weeks other most predicted result. Port Vale take their unbeaten run to four with a 89th minute equaliser. Yet another game with no spot-on, and just 3 got the outcome. There were 20 who prdicted a win for Port Vale. Tranmere leapfrog 10-man Exeter and move to within a point of the automatic promotion places. There were 4 who had this spot-on, and a further 13 got the outcome. A good set of fixtures picked by TheHappyGooner proved to be as hard to predict as they looked. This turned out to be the worst 10 game week of the season so far with just 16 spot-ons in total, but at least the 102 outcomes guaranteed points for everybody. In such a tough week there was an outstanding performance from sevebalo to have three spot-on, the wins for Leicester and Tranmere to go with his Stoke 0-0, and with three outcomes, he is this weeks top scorer with a brilliant 12 points. A good effort also to have two spot-on from noah4x4, the 1-0 wins for Leicester and Forest, and from Sector4, who had the Arsenal 1-1 and the Tranmere 2-0. With both having three outcomes they got an excellent 9 points. A reminder that the Happy Cup starts next Saturday with the Group stage Round 1 fixtures. All details can be found on the separate Happy Cup thread. In the Premier That brilliant effort from sevebalo continued his red hot form, as he takes his total to 35 points in the last four weeks. By having the Arsenal 1-1 spot-on RSCOSWORTH keeps the deficit down to a manageable 7 points, as they both seek their first Premier title. A back to form noah4x4 moves back into the final Charity Shield spot. But with only 11 points separating 3rd to 10th, there is as much chance of ending in the top three as being relegated for the members in those positions. They may of picked a decent set of fixtures, but they didn't do TheHappyGooner any favours, and they becoming isolated in the relegation zone. In Division One A third week without a 3 pointer has left Colukev clinging onto the top spot by a single point, as the pack close right in. The good recent run from basher2010 continued by having the Tranmere 2-0 spot-on, that means he has had least one 3 pointer in 7 of the last 8 weeks. 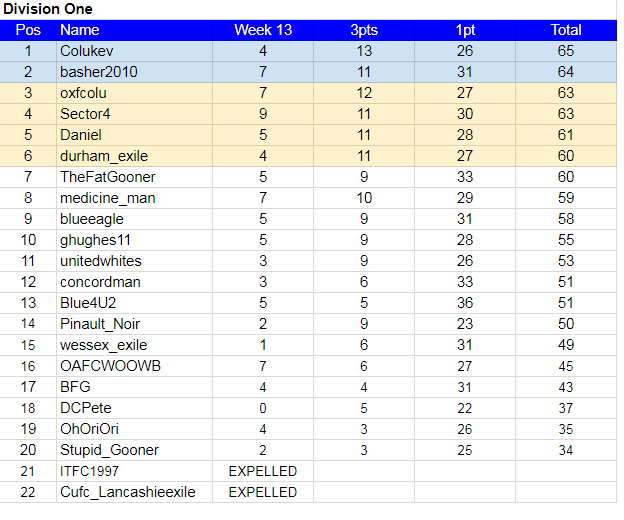 Best of the newbies continues to be oxfcolu, and he stays in contention for the automatics by having the Forest 1-0 spot-on. By getting 9 points for the second week running Sector4 moves up another three places, as he looks for an instant return to the Premier. The potion continues to work for medicine_man as he gets an impressive seven outcomes. More outcomes than anybody in both leagues for Blue4U2, but a lack of 3 pointers keeps him the bottom half. A seasons best score for newbie OAFCWOOWB, thanks to his good Gillingham 3-0 pick, will give him hope for the future. Good grief. Sorry everyone. This week totally got away from me. I apologize for not posting. My mum’s boyfriend is visiting from Tennessee this weekend. Things got distracting. Will post early this week. Again, sorry, everyone.